In 1945 – 1946 the department was occupied by the Soviet Red Cross and Red Crescent Movement, involved in collecting and preparing to transport the former Allied prisoners of war. Grouped, among others French and Italians. From the end of 1946 to middle 1947 the Castle was used by the State Repatriation Office as a collective expelled Germans. Between 1950 – 1953 it was established Technical Building and Road school. After, the place was in used of instructions that not care to maintain the premises in good condition. In 1965-1975 the durable construction and restoration for adaptive locking Polish Scouting and Guiding Association and museum spanned the years 1965-1975. In 1971-1993 in the museum of the palace there, which is a branch of the Archaeological Museum in Wrocław. In 1975-1992 the castle uses Central School Polish Scouting and Guiding Association Instructors. In 1992 Oleśnica District Office took charge of Oleśnica Castle and a year later the palace was transferred to Voluntary Labour Corps Headquarters for the creation of the Centre for Training and Education. In 1796 Oleśnica Castle was dwelled by Fryderyk August - the Duke of the Welf dynasty. He made new divisions within the castle. The southern wing was dedicated to Dukes apartments, western for Duchess apartments. Continuing the work of predecessor, the Duke focused on the castle garden. Seeing no possibility of further extension of the castle, Fryderyk August began to extends Szczodre palace, which became his great residence (1802). Consequently Oleśnica Castle lost princely rank. In the years 1816-1884 the northern wing of the castle was hosted by administrative officers. In 1885 the castle became the residence of each heir to the throne of the German Empire and the Kingdom of Prussia – increased rank. In 1885 the Castle provided heating and lightening. For visible internal changes include, increasing Hunting hall (now Knights) and embellishing the ceiling and walls – wood panelling. Visible changes to the exterior, including displacement of the entrance to the castle at the centre of the northern wing. In place of the old entry staircase placed, facilitating communication castle – palace. In addition, the palace made a new connector with castle. After 1906, the Castle was the seat of the summer and winter recreation heir of William, of his wife Cecylia and children. After the abdication of the emperor in 1918 in the castle lived Princess Cecylia. In 1923 the former crown prince had returned and in 1926 the castle became his property. For the time it takes to rebuild the castle into palace residence. At the beginning stables were moved from the east wing outside th castle. Ceilings of several rooms were decorated with stucco ornaments, beams and paintings, windows were enlarged for better room lightening. The corridors were begun to build and in the east wing the staircase was built. Between the south wing of the castle and the pond was established garden in the French style (after English). Visible changes took place in the west wing – took the form of sloping ceilings roof (about 1750). In the north wing new chambers for the courtiers and service were built. In the first two decades of the 13th century on the site of the present castle was a medieval town. After location Oleśnica (1255) its rank increases, and the 1924 became a border stronghold Głogów principality. The Castle begins to grow at the site of a medieval town. After the construction, the Castle was subjected to frequent upgrades. In the castle lived and ruled the principality alone or jointly for 1492 Piast dukes, bearing the same name – Konrad. 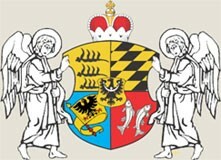 Two movements were preserved during the gothic period: Shield bearer and the Prince crest. - The eastern flank (1585-1586), between first and second floors of a figure placed Keymaker sgraffito, knights duel, and the arms coats of the Ziębicko-Oleśnicki and Legnicko-Brzeski principalities. - Galleries orbiting eastern flank and the tower (1589-1608), then north wing. - Gate – arms coats of the top of the gate. Medallions with reliefs depict heraldic shields principality Ziębicko-Oleśnicki and two wives of Duke Karol II (Katarzyna Berkova from Dube nad Lipy, and Elżbieta Magdalena daughter of Jerzy II Duke of Legnica-Brzesk principalities). - Bastions of defence (1603-1610). - New traffic routes connecting the palace with the castle, the palace of the castle church and the palace staircase (1616).